By the time Codie was just nine years old, he was already running drugs for his mother’s boyfriend. “I didn’t know what was going on and I’d do it without hesitation, thinking everything was okay,” he says. “Growing up, I thought I lived a pretty normal life, but I soon realized that it was crazy.” When Codie was 12, he started drinking to cope with the chaos in his life and, by the time he was 14, was using hard drugs. 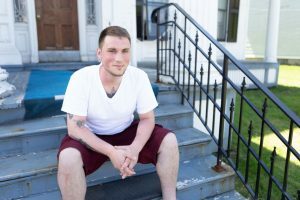 It was the beginning of an eight-year struggle with addiction that cost him everything he held dear. 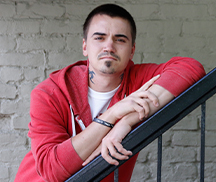 “I lost my friends and my family and wound up homeless, roaming the streets.” Codie had tried rehabs in the past and always relapsed, but when he was 22, he decided to give it another try and came to our Addiction Stabilization Center. It was then, during a chapel service at the Mission, that he gave his life to Christ. “An overwhelming joy came over me and I felt like Jesus was actually hugging me. I’d never felt so calm, so at peace with myself,” Codie says. He then entered our Parker House Aftercare Program, and through counseling, case management, Bible studies and life skills classes, has grown stronger in the Lord and in his sobriety. Codie’s relationships with family and friends have been restored, as well. “Everything has been falling into place. It’s a miracle.” Codie plans to go to college and become a certified substance abuse counselor with hopes of working at the Mission one day. “I’m going to help people just like the Mission helped me,” he says. “They gave me hope.” This Easter, Codie will be celebrating the beautiful new beginning in his life – made possible by your generous support. “Before coming to the Mission, I was a homeless drug addict. I thought that would be my life forever, that I’d never be able to have a normal life. But now I have everything I could ever ask for and more. I see a bright future.” “I thought I’d never have a normal life. Now I have everything I could ask for.” Download our Easter 2019 newsletter in PDF format. “The Lord wanted more from me.” Tim grew up in a strong Christian home with a desire to be a Godly man but, over the years, he’d fallen into a self-centered lifestyle. “I partied off and on. I wasn’t really following the Lord,” he says. He wasn’t at peace. He knew God wanted him living a different way, so he quit partying, started going to church and began spending his free time with his family. But he soon found out that it wasn’t enough. God was calling him to a deeper change. “The Lord wanted more from me, but I was still self-centered.” He couldn’t have known that God was about to use a hardship in his life to win his whole heart. “I got injured at work, and lost my job and my apartment in one day,” he says. It was then, at his mother’s urging, that Tim entered our Parker House Aftercare Program. “I thought it was just to put a roof over my head until I healed, but it turned out to be a much greater blessing,” he says. 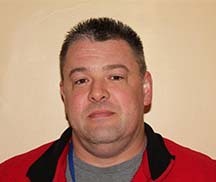 “Through counseling, chapel, prayer, and classes, I rededicated my life to the Lord and started thinking completely differently.” “I changed from self-centered to selfless.” Tim demonstrated that selflessness by volunteering five days a week at our front desk, and working in our clothing closet and food pantry. Thanks to his hard work, after graduation, we invited him to join our staff as our Community Service Receptionist. “I now know my call is to human services. I’m so happy with the people I work with and what I do.” We also invited Tim to live in one of our West Street Apartments set aside for the homeless. “It’s rent-free for a year so I have time to get back on my feet,” he says. This Christmas, as Tim celebrates Christ’s birth, he’ll also celebrate the joyous new life he found inside our doors… because of your compassion. “The Mission gave me a wonderful chance to start over. They really do change lives.” Download our latest newsletter in PDF format. "We can't watch you die." Daniel has worked in the restaurant industry his whole life. The tough environment led to frequent drinks to relax with coworkers – but Daniel soon felt overwhelmed. He says, “Things got stressful. I took on too much responsibility and started drinking more heavily.” He had been living with family and friends, but they told him to move out because they could no longer watch him kill himself. He ended up homeless on the streets – alone and bitter. Then, one day, God used a chance encounter to soften Daniel’s heart. When he stumbled into a day center, a nurse on duty asked, “‘Can I pray for you?’ I said, ‘Yeah, go ahead. Anything will help at this point.’ And she held my hand and I felt hope for the first time in years,” he says. Daniel remembered visiting the Utica Mission with his youth group years before. His hope led him to the Mission, but he was still unconvinced God could really change him. So he gave God an ultimatum – 90 days to fix his life. Daniel came to Parker House, our long-term discipleship program that gives men a safe place to heal from addiction and other destructive behaviors. Within that 90-day period, he was surprised to see how “God gave me little blessings, little gifts to keep me going, saying, ‘Look, it’s not that bad. I’m with you, OK?’” as his life transformed rapidly. Today, he is sober, working part-time at the Mission, completing his Bachelor’s degree in Social Work, buying a house and engaged to be married – dreams he never thought he would accomplish before coming to the Mission. “Now I know how to fail – how to live beyond what’s right there. This is all from the grace of God, and it didn’t happen overnight. God will give you what you need just a little bit at a time. He reveals it slowly to you.” Daniel has a heart for serving others and is so full of gratitude for friends like you who showed him that change was possible. Thank you for your continued generosity. Download our latest newsletter in PDF format. “I couldn’t do anything without drugs,” says John, the son of a minister. “I lost my family, I was homeless and I’ve been to prison.” Like so many of the men here at the Mission, John had been introduced to drugs as a young man. And for nearly 25 years, the powerful grip of addiction cast a dark cloud over his life. “I came to the Mission because I was sick and tired of being sick and tired,” John says. Our staff and counselors opened their arms to John, without judgment, which is exactly what he needed. He was soon placed in Parker House, our residential discipleship program that offers men a safe environment in which to grow spiritually while healing from addiction and other destructive behaviors. “I always had God in my life,” John says. “I left God. God never left me. 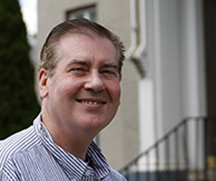 But I truly surrendered when I came to Parker House.” When John graduated from the program, he began volunteering at the Mission as a way of giving back. Before long, he accepted a job with us, working in housekeeping and maintenance. He is happy for the work and loves the opportunity to encourage men entering the program. “I share my story with anybody that wants to hear it,” John says. “If I can do it, they can do it. 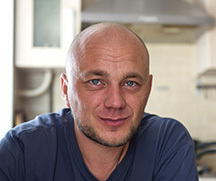 And if they need to talk, I’m here, because somebody was there for me.” John has now been clean for 4 years and has reconnected with his family. He is deeply grateful for the Mission and for people like you who support it. “There are people out there who need an organization like this to help them get back on their feet,” he says. “A place like the Mission can make people feel good about themselves.” Download our latest newsletter in PDF format. Tim was born to teach. “My mother was a teacher, and my parents stressed the value of education and public service,” he says. He followed that path, earning a Bachelor’s degree in English Literature and a Master’s in Secondary Education and Adolescent Development. But he was injured in a car accident in graduate school and became addicted to prescription painkillers. “I would see multiple doctors,” he says. 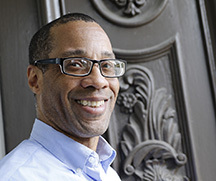 “I had unfettered access.” Nevertheless, Tim graduated and found a teaching job he loved. “I was good at what I did. I cared and was thoughtful in my planning,” he says. 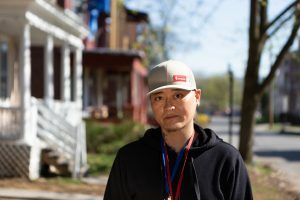 “I was able to keep the house of cards standing for a little while.” But when it became more difficult to get the prescription drugs, Tim switched to heroin and the house of cards fell. “Bad things started happening – cars getting repossessed, losing jobs,” he says. It was then he decided he’d had enough and, after trying several rehabs, entered our Parker House Aftercare Program. “I hadn’t really believed in God up to that point, but I’d seen how much happier people are who have that spiritual element in their life, and I wanted that,” he says. “I’ve embraced it now and things have gotten a lot better.” Tim is now using his education and teaching gifts to help others by tutoring at our Learning Center. “A lot of people weren’t offered the advantages I was and don’t have a high school education. I’m helping them prepare for their GEDs,” he says. “It makes me feel good.” Because of your support, Tim, and people like him, find help and hope when they walk through the doors of Rescue Mission of Utica –at Easter and always. “Without the accountability here, I probably would’ve slipped.This program literally saves lives.” Download our latest newsletter in PDF format. From a close-knit family, William suffered trauma at the age of 11, when his dad and brother died within a year of each other. For years, William struggled to find a role model. 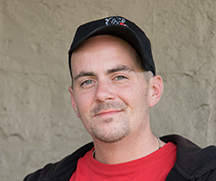 “I started looking elsewhere for mentorship, and most of the people that I drifted to were involved in street life, criminal activity and addictions.” Soon, William immersed himself in similar, destructive behavior. “It escalated to a life of jails, compromising everything I learned, all my values, and total spiritual death.” After 35 years of drug use, rehab attempts, homelessness and everything in between, William finally hit an all-time low when his mom died in 2013. “I ran to the Addictions Crisis Center, which is here on the Mission campus.” While here, one of our nurses remembered him from a time he came before, and said something he wouldn’t forget: “It’s alright, buddy. We love you. We miss you. We were worried about you.” However, not long after, William relapsed and ended up in prison. Today, he sees it as a blessing, because he encountered the Lord. “I sincerely believe that had I not gotten arrested, my life would have been miserable. I would have died alone.” After being released, he was placed in a program that helped him finally break free of his addiction for good. He thanks God for a second chance. Feeling led here, William joined our team as a clinical supervisor! He helped the incoming men with detox, guided them through addiction recovery and ensured they were mentally strong. William was raised in the Muslim religion but says it actually led him to Jesus! “My spirituality was just elevated by the grace of God through the Holy Spirit, because I always had something dear for Jesus in me.” After his long journey, William says, “I’m just thankful to be alive, and to be able to use what God has given me to share in this community.” He is thrilled by his transformation thanks to God’s love in his life – and your support! “It’s amazing to come from being a person who was spiritually bankrupt to having some coins of joy and happiness in my life.” Download our latest newsletter in PDF format. "I am much happier with myself." Peter grew up in Northern Ireland, where one thing was the cultural norm: drinking. Before he was even 10 years old, Peter would drink a Shandy (beer diluted with lemonade). He moved to the states in his early twenties and maintained a comfortable life. “They call it a higher functioning alcoholism,” he says, “where you protect your work… and you let everything else sort of go away.” As a result, Peter’s relationships with his wife, children and friends were crumbling, but it took awhile for Peter to notice. “All those years, I had this funny sense of normal. 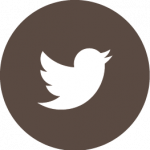 I work, I drink, I work, I drink…” Eventually his health started to deteriorate too. Peter’s son worked at the Mission and suggested he go to the Addictions Crisis Center—a triage for those battling substance abuse. There, he found that, in addition to alcoholism, Peter was suffering from mental exhaustion. A nurse read him Proverbs 24:16, a verse about falling seven times and rising again. “That gave me a lot of peace, and I started to seriously think, ‘Maybe I needed a little bit more help,’” he explains. Peter wanted to join a spiritually based program that would make him feel safe and close to his family. He found all of that at the Mission. 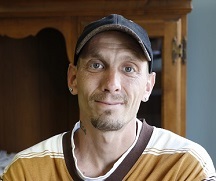 In our program, by learning life skills, overcoming his addictions and rebuilding his relationships, Peter has thrived. Peter can see the worth of the Mission. “There is an opportunity here for folks to get their lives back together again, and not be a burden on society. There’s so much good here… helping people leave a positive impact in the community.” With a heart of thanksgiving, Peter moves forward into a new life. 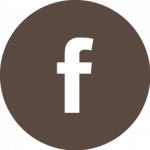 “I’m recently discovering who I am, and the whole foundation for that was the slow, steady peaceful time that I had here.” Download our latest newsletter in PDF format. Tommy started using drugs when he was only eight years old. “I got into crack, cocaine, heroin – anything I could get my hands on,” he says. “When I was 10, I started using meth.” His mother sent him to live with his grandmother when he was 15, hoping it would help, but things only got worse. 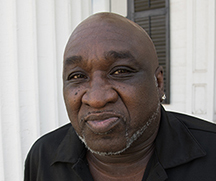 “From the time I was 16, I was in and out of foster homes, group homes, and jails. I quit school, lied, stole and hurt people, and I didn’t care,” Tommy says. “Then I started making and selling meth and coke, and the more I made, the more I wanted it.” Tommy served a 10-year prison sentence for manufacturing and selling drugs. After his release, he went on a drinking binge. It was then his parole officer suggested he come to Rescue Mission of Utica. Tommy decided it was worth a try. He didn’t believe in God when he arrived at our Parker House Aftercare Program, but when he saw the joy of the others in the program, he wanted what they had. “I started praying for forgiveness and I got baptized,” Tommy says. “Now, I pray every morning and read my Bible, and God has been showing me the right things to do.” Tommy has now earned his GED and plans to go into Phase 4 of our Aftercare Program, where he’ll receive spiritual mentoring while training for work in asbestos removal. “Without the Mission, I’d probably be back on drugs, on the street, in prison or dead,” he says. “They’ve shown me how to get close to God and given me the tools to stay clean.” Download our latest newsletter in PDF format. Chris describes his father as an alcoholic. “All I knew how to do was watch him drink,” he recalls. “At the age of 9, I picked up my first beer… and I loved it.” He started stealing his dad’s liquor, and by 14, the onset of addiction began to take its toll. Chris was getting into trouble and letting his grades slide. Athletics became an outlet for his frustration, and he excelled at baseball. He dropped out of school his senior year and tried out for the major leagues. But when a shoulder injury ended his hope for a career, his drinking escalated and his life spiraled downhill. Chris started experimenting with drugs and couldn’t hold a job. “I got arrested… I was in and out of jail… in and out of rehab,” he says. It was a miserable existence that lasted 20 years. But along the way, he heard about Rescue Mission of Utica. Finally, after seeking our help, he gave his life to the Lord. “I accepted the Lord fully and completely,” Chris says. “I’m staying sober and I understand now that I can pray and rely on Him instead of taking charge myself.” With a new outlook on life, Chris strives to excel in everything he does and willingly accepts both criticism and compliments. His positive attitude and behavior have paid off. He was recently offered a position at a company where he began as a volunteer. “Because of the work they’ve seen me do, they gave me a job,” he says with gratitude. 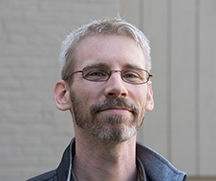 Chris is grateful for the many other virtues that have changed his life so dramatically – and that he was able to develop them through your support of our programs. “The Mission built my self-esteem… my confidence… my humility. It built responsibility, respect and patience,” he says. “The Mission gives you a base… a firm foundation to build yourself up.” Download our latest newsletter in PDF format. Sean was in second grade when his parents divorced. “It bothered me deep inside that my father wasn’t there all the time,” he says. “I was dealing with depression.” He started smoking marijuana in high school to “escape” from his sadness and, after he went to work, turned to alcohol. But when he was arrested on a substance abuse charge, he realized he truly had a problem. After that, Sean went to a number of rehabs, but he always relapsed. “One weekend, I started drinking after work on Saturday and by Monday, I realized I couldn’t stop,” he says. Sean lost his job and his apartment, and slept on friends’ sofas for several months until he wore out his welcome. “I ended up sleeping on a porch and that’s when the police came and brought me to the Mission,” he says. 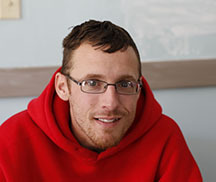 Sean was in our Addiction Crisis Center and then moved into Parker House Aftercare and began our Spiritual Life Program. “I was just trying to conform and get out as soon as possible,” he says. Then he took on the assignment of giving a talk about five reasons he was going to heaven. “I searched the Bible for a couple of days and something happened to me,” he says. “The words came alive. Since then, it’s become part of my identity and my relationship with God keeps getting stronger.” Sean graduated from the program, has his own place, and is attending community college. “I’d like to go to seminary so I can minister,” he says. 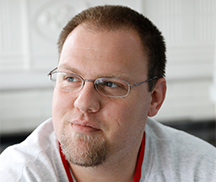 Sean is grateful to the Mission for helping him change the course of his life. “Seeing how these people live their lives gave me hope,” he says. “They’re my family, now I’m not alone.” Download our latest newsletter in PDF format. "THE WORLD TEACHES YOU THAT ‘SEEING IS BELIEVING,’ WHEREAS WITH GOD, ‘BELIEVING IS SEEING.’ "
Over the course of 12 years, William tried living every which way but God’s way. “I was full of pride and ego,” he admits. He went to church when he was young and had some Biblical understanding. “But I got wrapped up in the world and did what I wanted to do.” Which, for him, was alcohol and drugs. His growing addiction led to carnal and selfish behavior that separated him from the people he loved and left him believing he had little to live for. Eventually, he ended up in a mental hospital, suicidal. “I was at my wit’s end,” he says. “I was so tired of my life and the way things were.” When he learned our Parker House residential aftercare program had an opening, he felt a spark of hope. “I honestly feel it was the hand of God on me, trying to nudge me into His family,” William recalls. He decided to give God a chance. “That was the start of my walk with the Lord,” William says today. His desire to use alcohol and drugs is gone...and he’s thinking about going to a Bible college. “I’m figuring out what the Lord is calling me to do.” And he’s grateful for friends like you: “Your prayers and the money you donate are helping people who want to be helped. God bless you for all you do.” Download our Thanksgiving 2016 newsletter in PDF format. Every morning, Matt woke up wondering what he’d done the night before. “My drinking got to a point where I lost everything.” He moved in with his sister, thinking a location change would change him. But as he says, “The drinking came with me. After two weeks, she kicked me out.” Matt ended up wandering around Syracuse with only a backpack. “I had no hope...no clue where to go.” He ended up next to a railroad track. “I was waiting for the train because I was going to jump in front of it and end it all.” But God was at work in Matt’s life, even at this darkest moment. Without realizing it, Matt dialed 911 on his phone. An operator dispatched an ambulance to come get him. As it pulled away with Matt in the back, the train sped by and Matt was amazed at how close he’d come to a brush with death. Because of a referral to Parker House, he showed up here. He’d been to detox before, but had never tried a Christ-centered recovery program like ours. “Parker House is the best thing that’s ever happened to me,” Matt says, smiling. “Not just Parker House, but the Mission, too. I’m so grateful for all they’ve done. You can feel how much the people here really care.” Matt had always numbed his anger with alcohol. But as he let Jesus fill the void in his heart, something amazing happened: “Jesus said, ‘I got you,’ and it felt so much better...I didn’t have to drink away my problems.” Today, Matt’s part of our Phase 4 program, which gives men a safe place to further their walk with Christ and prepares them to transition back into the community. He also volunteers here at the Mission 20 hours a week. He’s working to get into community college, but Matt’s main goal is to stay focused on what matters: a steady, sober life with God at the center. “The Mission has completely changed my life and my attitude. It’s awesome to be happy.” Download our Fall 2016 newsletter in PDF format. "I Didn't Want to Be Rescued"
I could almost see the bridge ahead. I was drunk and driving about 120 mph, and I knew I could easily crash through the rail, and plunge into the water below. Then it would all be over. All of my darkness and depression. A cop car pulled in behind me, lights flashing. So I pulled over. If I had gone through with it, they’d jump in and rescue me. And I definitely did not want to be rescued. My downward spiral started when my parents divorced. I was 3, and I ended up with my dad, visiting my mom on weekends. She spoiled me, buying me everything I wanted. Dad died of a heart attack when I was 15, and I started drinking, getting drunk on weekends. But I wasn’t an alcoholic . . . yet. After Mom died, when I was 25, I was so devastated I started drinking all the time. Over the next 16 years, I considered suicide many times. But every time I tried, someone would “interrupt.” I wanted to be alone when I did it. When the cops pulled me over that night, I was arrested for DUI and spent 3 weeks in jail. But as soon as I got out, I bought some beer and got drunk. There was a heavy snow that day, and three snow plows were going up and down the street. I decided that when they circled back around, I would jump out in front of them and kill myself. But they never came back... I figured God must want me alive. So I checked into rehab that day and spent three months there. After that, I wanted a faith-based follow-up, so I got into the Mission’s Parker House Aftercare program. I haven’t stopped smiling since I’ve been here. I feel better than ever. I’m getting the spiritual nourishment I’ve needed. I have real friends for the first time. And I’m having fun that’s not based on booze and partying. I’ve dedicated my life to Jesus, and I’m doing very well. Thank you for making that possible! Thank you for rescuing me. Now I have a future filled with hope!